This intermediate acrylic pouring class is a follow-on class from Introduction to Acrylic Pouring. In this session, Maggie will work with you on your finished pieces from your introduction session or your continued work at home, introducing different finishing techniques and embellishments that will take your work to the next level. In the workshop Maggie will demonstrate several different acrylic pouring techniques that create beautiful effects building upon your acrylic pouring skills. You’ll learn how to swipe to create a crashing wave, using your swiping and air blowing you’ll create a stunning flower, you’ll discuss how to do post pour embellishment AND look at what you can actually pour on and get experience 3D pouring on a bowl! 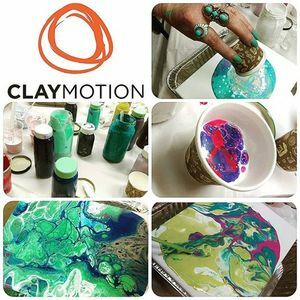 There will be lots of discussion about the many many ways acrylic pouring can be applied, Maggie will give you a hand out of the many methods and ways you can use your specially prepared paint to make gorgeous art work. Embellishment – In this part of the class we will discuss how to look at your poured composition and then add more into it using the pour as a background. Often, it’s best to have a few people look at your image to help you find that hidden inspiration, so bring along a pour that you’d like to work on and let’s see what we can help you discover within the patterns and cells. Pouring Substrate – During this part of the workshop we will discuss what objects you can pour on, what special considerations you might need to make in relation to preparation and the pouring process. As a class we’ll help each student feel inspired and excited with ideas and concepts- at the end of this conversation even the dog will be at risk of being poured on. 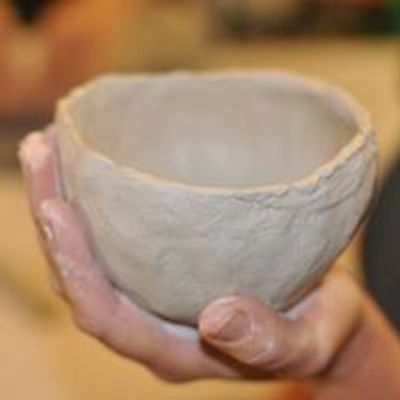 Each participant will get to leave the workshop with two canvases and one glass bowl creation! It is a pre-requisite that you have completed an introduction class with Maggie from Art Maggik. What to wear Please bring something that can get messy, aprons are provided. Closed toed shoes are requested for all classes.